Bushfires in Queensland have ushered in the “new normal” of superfires in Australia. California has already experienced this new normal. It means that these fires are now catastrophic. They encroach on human habitation. Fire behaviour has changed. Their intensity is greater. Their severity is greater: their flames are higher. Fires last longer, and come with increasing frequency. They spread at higher rates, and jump gaps such as roads, rivers and fire breaks. . These fires now do long -term damage to the ecosystem. The earth underneath is affected, habitat destroyed, killing all the normal bacteria and inhabitants of the soil. Many are fires that are impossible to put out. The background to these new superfires is climate change. Climate change has brought higher temperatures and drought – resulting in drier trees and other vegetation – meaning that tinder-dry fuel is ready for ignition. Australia is uniquely vulnerable, as the driest continent, with its prevailing eucalypt forests. Australia is vulnerable to a similar radioactive threat. Last year, bushfires went uncomfortably close to the Lucas Heights nuclear reactor. Plans to transport Lucas Height nuclear waste 1700 km across Australia to Flinders Ranges area mean that this radioactive trash would be at risk of accident, and one of the worst risks would be bushfires. Australia must face up to the climate change threats – floods (as more water vapour, due to heat, will come down as flooding) , sea level rise, and super bushfires. Lucas Heights nuclear reactor should be closed, and ANSTO’s nuclear dream prevented from becoming Australia’s climate-nuclear nightmare. 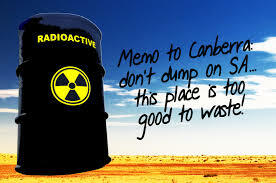 Woomera must be considered fWor radioactive waste facility, Senator Rex Patrick says https://www.adelaidenow.com.au/business/sa-business-journal/woomera-must-be-considered-for-radioactive-waste-facility-senator-rex-patrick-says/news-story/3b8171ca619079bc36b1b35c19861cf9?fbclid=IwAR0FQ-25ObeztDdNn5d9xLWOpJuDHJkaEBAIIT9r6sSpj52tRW_uTaCCLhc Erin Jones, Regional Editor, The Advertiser, November 28, 2018 Renewed calls have been made for Woomera to be considered as the site for the national nuclear waste repository to end the divide in two South Australian country towns. Centre Alliance Senator Rex Patrick said the 122,000sq km Woomera Prohibited Area should be revisited after a freedom of information document showed the reasons why it was rejected were “shallow”. His calls come as Kimba and Hawker remain in limbo as to whether they will be chosen to host the low-level waste facility, with community ballots delayed until early next year. Renewed calls have been made for Woomera to be considered as the site for the national nuclear waste repository to end the divide in two South Australian country towns. “We have a divided community in both Hawker and Kimba and there is a site that may well be very suitable but has been dismissed on very shallow grounds,” Senator Patrick said. Woomera was one of four defence sites in SA to be identified by the Federal Government that met suitability criteria for the repository. The Defence Department, in 2016, said it did not support the facility at Woomera as it was “incompatible” with its weapons testing range and missile launch site. However, a 2002 Education, Training and Science Department report found the site would be a preferred location, in part because both low and intermediate-level radioactive waste had been stored there since 1994-95 without incident. This includes the CSIRO storing 10,000 drums of waste at the site. Resources Minister Matt Canavan told The Advertiser the site was unsuitable due to defence operations. He said waste at the site must be moved outside of the controlled defence area. Woomera was identified by the Howard Government as the potential repository site in 1998, but was shelved following backlash from the Rann Government. After a few of us attempted to enter the closed and impenetrable BCC meeting on Tuesday in Quorn, we were left with some guidelines. The transcript from this meeting will be available on line. Why all the community exclusion now, Ian Carter? Kazzi Jai This is NOT COMMUNITY CONSULTATION! This is the manipulation of a system of committee, whereby the commercial outcome is dependent on confidentiality. This is NOT the purpose of this committee in this case! This is simply the APPEARANCE of community consultation, where there is in fact NONE! Was Woomera rejected as nuclear dump site, because the plan is to later IMPORT NUCLEAR WASTE? Katrina Bohr 1,000 known drums of radioactive waste currently stored at Woomera came to public notice in early 2016. They were graded by ARPANSA and classed as low to intermediate nuclear waste. Earlier this year the 1,000 drums were all classed as low level waste. Sounds like a result to suit purpose. I personally don’t trust anyone involved in the development of the NRWMF. Steve Dale “The siting of RWSF outside the Woomera Protected Area would have no compatibility impact on Woomera Test Range activities …” that statement doesn’t say it can’t be in the Woomera area, it is a pretty mild statement, yet the nuclear pushers twist it into being “it must not be in the Woomera area!”. The reality has been far more like morose miners on methadone. After a decade that has seen sustained Aboriginal and wider community resistance to mining plans, the uranium price plummet in the wake of Fukushima and a surge in renewable energy production, there is not a single operating uranium mine in WA. Uranium exploration companies were a dime a dozen but just four projects surfaced as having potential in WA. Three of them raced through the environmental assessment process under the Barnett government and emerged with environmental, but not final, approvals just weeks before the state election in a clear move to wedge the incoming Labor government. The McGowan government felt the wedge and let the four mines with partial approvals continue ‒a clear breach of Labor’s pre-election promise not to allow mines to proceed unless they had full approvals. But the sustained low uranium price and community opposition has thwarted plans to develop any of the four mines. Cameco has written off the entire value of the Kintyre project, Toro Energy has shelved its uranium plans and is now trying to strike lucky with gold, Cameco’s Yeelirrie project is the subject of a legal challenge by the Conservation Council of WA and three traditional owners and then there is Vimy’s Mulga Rock project. Vimy released its Definitive Feasibility Study for Mulga Rock earlier this year and the company is reportedto be “confident of securing contract prices of about $US60/lb this year or next for delivery in 2021 when it hopes to be in production with Mulga Rock.” There was supposed to be an investment decision by July but instead Vimy was handing out pay cuts and scaling back or bunkering down for the sustained lull in the uranium price (currently around $US30/lb). And while Toro is looking for gold ‒and other uranium companies have diversifiedinto medicinal marijuana production or property development ‒Vimy is hedging its bets by setting up a subsidiary to explore for base metals. Globally there are 115 nuclear reactors undergoing decommissioning‒double the number under construction. The International Energy Agency is warning about the lack of preparation and funding for a “wave of retirements of ageing nuclear reactors” and an “unprecedented rate of decommissioning”. A growing number of countries are phasing out nuclear power, including Germany, South Korea, Switzerland, Belgium and Taiwan. The world’s most experienced reactor builder, Westinghouse, went bankrupt last year and the debts it incurred on reactor projects almost bankrupted its parent company, Toshiba. After the expenditure of at least $A12.4 billion, construction of two partially-built reactors in the US was abandoned last year, and the only other reactor construction project in the US was almost abandoned this year after cost overruns of $A14 billion. No wonder that nuclear lobbyists are themselves acknowledging a “crisis that threatens the death of nuclear energy in the West” and are already writing eulogies about the “ashes of today’s dying industry”. Seeing this, we students do not shout at each other across the classroom. We sit in a shocked silence. Afterwards, we shout, with our signs and our demands. Because how can an educated person know all we know, and do nothing? Mr Morrison and his government continue to overlook the danger of climate change, while not seeming to have a problem helping coal miners such as Adani dig up and burn more coal. It’s surreal to watch nothing significant happening on the parliamentary floor, when the solutions have been made so clear. We are one of the sunniest and windiest countries in the world, yet our government chooses to burn more coal. By making a stand and organising our communities, we can push our politicians to represent us, not lumps of coal…….That is all we want – for a serious problem to be treated seriously by our politicians. We need the fire of climate change to be confronted, not left to engulf my generation. Almost 10,000 Queenslanders are being forced to flee to shelter as wildfires fanned by catastrophic conditions bear down on their communities. Firefighters in Queensland are battling almost 140 wildfires, with the worst in central Queensland in destructive conditions that have been compared to those that fanned the infernos that recently decimated California. Mandatory evacuations have been ordered and 37 schools closed amid a new blaze near Rockhampton and monster one farther south that’s already razed at least four homes and scorched tens of thousands of hectares of bush and farmland. A large fire sparked shortly before 3pm on Wednesday has since raced towards Gracemere, prompting authorities to order a mandatory complete evacuation of the 8000 people in the area. Queensland Police Commissioner Ian Stewart told people not to panic but make for the Rockhampton showgrounds around 14km away, where an evacuation centre has been set up. ……..Firefighters have been fighting since Saturday the monster fire near Deepwater, Baffle Creek, Rules Beach and Oyster Creek, Eungella and Dalrymple Heights, where people were ordered to evacuate before fires cut road. Most people got out by road but some had to be ferried over Baffle Creek. ……….Deputy Police Commissioner Bob Gee had bluntly warned people that the conditions were so dangerous people could die if they stayed put. Brian Smith, Regional Manager for the Rural Fire Services Central Region, said experts were comparing the conditions in Deepwater to the Waroona fires in Western Australia, which completely wiped out a town a few years ago, and also to the recent deadly California fires. Interstate crews arrived on Tuesday to help fight the inferno in Deepwater that’s destroyed homes and burnt through at tens of thousands of hectares of bush and farmland since Saturday. Students hit back at PM after ‘less activism in schools’ climate change comment, SBS, 28 Nov 18 Hundreds of students are planning to leave school this Friday to protest government inaction on climate change. 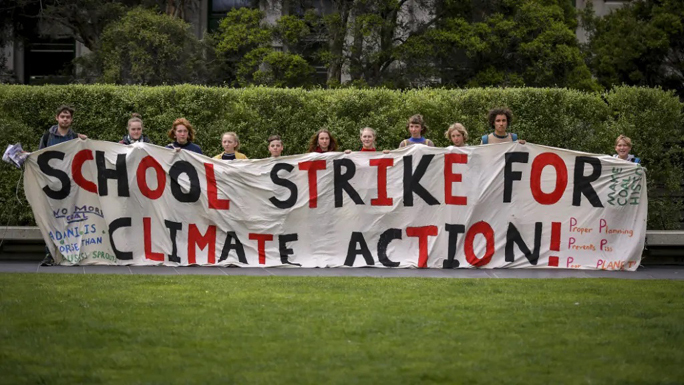 There’s a storm brewing between Prime Minister Scott Morrison and school students planning a national strike on climate change inaction this Friday. Hundreds of students are vowing to put the books away and converge on MP offices and parliaments around the country in the Big School Walk Out for Climate Action. On Monday, Mr Morrison implored children to stay in class rather than protesting things that “can be dealt with outside of school”. What we want is more learning in schools and less activism in schools,” he said. But students aren’t happy with the response. Melbourne student Jagveer Singh, who will take part in the protest, said Mr Morrison’s broadside made him “want to go on strike even more”. [We want to] demonstrate that we’re not happy with the federal government for not listening to us and demand that we get a safe climate,” he said. “It’s our future. We are the ones that will be facing the consequences of the decisions that are made today, and that is why we need to have a say. WA’s uranium promises fail to appear, Midwest Times, Dave Sweeney, 21 Nov 18 Ten years ago this week then premier Colin Barnett ended Western Australia’s long-standing ban on uranium mining. Industry promoters boasted of a new mining sector that would be “iron ore on steroids” and the speculation and exploration began in earnest. In the intervening decade widespread community concern and resistance, combined with a depressed commodity price and a growing appetite for renewable energy, has seen the uranium dream fade. Today there is not one commercial or fully approved uranium mine despite years of promotion and preferential treatment, and the few projects that continue to seek approval are strongly contested. This is good news for WA and beyond as uranium is a mineral with unique properties and risks that cause local damage and fuel global risk. Thanks to those who have helped keep the brakes on this contaminating trade and who have a perspective that lasts longer than a politician’s promise. A nuclear kingdom for Saudi Arabia’s Crown Prince Mohammad Bin Salman (MbS)? The horrific murder of Jamal Khashoggi shed light on the reckless and dangerous decisionmaking process of Saudi Arabia’s Crown Prince Mohammad Bin Salman (MbS). In addition to the latest crisis The New York Times recently published a story about how the prince’s closest security personnel sought to hire private foreign companies to assassinate senior Iranian officials—an act that could have trigger a regional military conflict. This conduct follows a string of other bizarre events in the last few months, initiated by MbS. The crown prince has demonstrated arrogant, cruel, amateur and capricious behavior. His aggression has been left almost unmonitored by checks and balances inside the Saudi hierarchy. Indeed, MbS has constrained all his potential rivals and has taken full controlof Saudi Arabia’s security and intelligence bodies. As the Khashoggi scandal has proven—such power enables dictators to secretly execute dangerous operations. In parallel, he managed to become the darling of the West after he initiated economic reforms and launched his so called modern 2030 vision . Now add Saudi’s long history of nuclear ambitions to the mix. For years, Saudi officials have warned that Saudi Arabia will not curb its nuclear ambitions if it will sense a threat to its national security, or if Iran advances in its nuclear program. Rumors were that Pakistan was obliged to provide the Saudis a ready-for-use nuclear weapon if and when the time comes. Things only got more complicated once the nuclear agreement (JCPOA) with Iran was signed in 2015, practically legitimizing Iran’s rights to maintain and develop its uranium enrichment capabilities. At the beginning of November 2018, the crown prince participated in the opening ceremony marking the launch of construction of Riyadh’s first research reactor . It’s still early days and only a symbolic act—the Saudis lack knowhow, technicians, infrastructure and academic expertise—but the country has both enough ambition and funds to advance anyway. Shortly after that the Saudi energy minister said the kingdom launches uranium exploration program. Following the murder of Khashoggi, Senate members urged the Trump administration to curb any intention to sell nuclear reactors to the Saudi regime. This move is certainly necessary, but not nearly enough. An American refusal to his demands can push the prince to seek an alternative option elsewhere, with producers that will be all too happy to assist—for the right price. Much of MbS’s current conduct lies parallel to previous experience with three other Middle East tyrants: former Iraqi president Saddam Hussein, Libya’s leader Muammar el-Qaddafi, and Syrian president Bashar al-Assad. These cynical dictators have a common denominator in their infinite ambitions, which ultimately led them to secretly promote a nuclear weapons program. They all relied heavily on their security systems in initiating these plans. Libya and Syria had no sufficient nuclear infrastructure, so they bought a turnkey nuclear project from Pakistan’s A.Q. Khan Network, and in the Syrian case from North Korea . The Saudi nuclear issue has placed a challenge before the administration. If the prince is successful in surviving the current crisis, then that could prompt him to make even riskier decisions, including taking the nuclear path. Much like in Iraq, Libya and Syria, all the necessary components for that are now in place: A de facto dictator with delusions of grandeur and poor judgment, full control over the security services, unlimited funds for the purpose, a national sense of isolation, an acute threat, and a long-term nuclear vision. As Iran seems to be complying with the JCPOA, a Saudi move could instigate a nuclear arms race in the Middle East. To avoid this, the Trump administration should warn and restrict the Saudi heir. It should also keep a very close eye on Saudi Arabia’s nuclear connections and activities. Ronen Dangoor is the former deputy head of the research and analysis division at the Israeli prime minister’s office. BY BRENDAN COLE ON 11/28/18 Scientists have reacted with dismay to President Donald Trump’s assertion that he was not among the “believers” in the seriousness of climate change. His administration released a dense report compiled by 13 federal agencies last week that painted a bleak picture of the severity of the impact of climate change on the lives of Americans, and the U.S. economy. “One of the problems that a lot of people like myself, we have very high levels of intelligence but we’re not necessarily such believers,” Trump told The Washington Post in an interview in the Oval Office. “As to whether or not it’s man-made and whether or not the effects that you’re talking about are there, I don’t see it,” he said, doubling down on his initial reaction to the National Climate Assessment report on Monday, when he said: “I don’t believe it.” …. The White House report warned that rising temperatures had already harmed the U.S., and that limiting greenhouse gases would substantially benefit the American economy…..
Andrew Dessler, a professor of atmospheric sciences at Texas A&M University, called the president’s comments “idiotic,” The Post reported. And Katharine Hayhoe, a climate scientist at Texas Tech University, told The Post: “Facts aren’t something we need to believe to make them true, we treat them as optional at our peril. This week marks 10 years since the ban on uranium mining was overturned by the former State Government in Western Australia. The Australian Nuclear Free Alliance (ANFA) sends a strong message of support and congratulations to the communities who have been so strong in their opposition to uranium mining in Western Australia. 10 years after the ban was overturned Western Australia remains free of any operating uranium mines.“We are happy to say there are no operating uranium mines in WA today and no immediate likelihood of any mines being constructed. This is a is a great time to acknowledge and pay tribute to the staunch communities who have stood strong, to the supporters the campaign and the stunning country that remains nuclear free.” West Australian ANFA co-chair Vicky Abdullah said today. The Australian Nuclear Free Alliance (ANFA) formed in 1997 and is a committed national network of aboriginal and non-aboriginal groups working together to halt the threat of the nuclear industry. ANFA continues to make very real and positive differences and deliver significant results and has played a pivotal role for communities in Western Australia working to protect country and culture from nuclear developments. Over the last 10 years, ANFA has worked hard to support WA communities challenging unwanted uranium exploration, mines and waste dump proposals. Today, there are four proposed uranium mines being contested, Mulga Rock, Yeelirrie, Wiluna and Kintyre. Each community has been very public in opposition to uranium mining and all have been well represented at the annual ANFA meetings. “Aboriginal people have long resisted and endured the impacts of uranium mining, nuclear testing and radioactive waste dump proposals in Australia. “This week, 10 years since the WA government overturned the ban on uranium mining with still no mines built is a strong example for Aboriginal communities that if you hold out and stand strong for country – you can win. We will continue to support the campaign in Western Australia to make sure uranium is left in the ground“ ANFA co-chair Vicky Abdullah concluded. The Local 28 Nov 18 President Emmanuel Macron said on Tuesday that France would shut down 14 of the country’s 58 nuclear reactors currently in operation by 2035, of which between four and six will be closed by 2030. The total includes the previously announced shutdown of France’s two oldest reactors in Fessenheim, eastern France, which Macron said was now set for summer 2020. Macron said France would aim to triple its wind power electricity output by 2030, and increase solar energy output fivefold in that period. 2021 before deciding whether to proceed with construction.